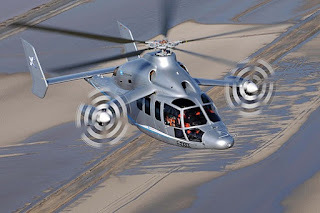 Last month Eurocopter announced that its X³ hybrid helicopter demonstrator had pushed "the frontiers in rotary-wing aviation" by surpassing its original speed target of 220 knot. The X³’s speed milestone was reached during stable, level flight. It maintained a true airspeed of 232 knot for several minutes during the mid-May flight, just its third mission after a scheduled upgrade that integrated the X³’s definitive gearboxes, enabling it to operate at full power. The X³ is equipped with a Eurocopter Dauphin helicopter airframe equipped with two turboshaft engines that power a five-blade main rotor system and two propellers that are installed on short-span fixed wings. This hybrid configuration was designed to offer the speed of a turboprop-powered aircraft and the full hover flight capabilities of a helicopter. “Future helicopters incorporating the X³ configuration will offer our customers about 50% more cruise speed and range at very affordable costs, therefore defining the future of high productivity rotary-wing aircraft,” said Lutz Bertling, President & CEO, Eurocopter. Eurocopter began X³ flight testing last September. After it achieved the initial true airspeed goal of 180 knot in November at a reduced level of engine power, the X³ underwent its planned gearbox upgrade and safety inspection. Since returning to flight, the X³ demonstrated its performance at full engine power, including "impressive climb and descent rates, as well as excellent maneuverability, while also confirming the hybrid propulsion system’s outstanding capabilities for acceleration and deceleration," according to Eurocopter. In the test program to date, the X³’s basic handling characteristics and stability have been validated throughout the aircraft’s flight envelope without the need of a stability augmentation system, which has been confirmed in testing performed with the autopilot disengaged and engaged. Also, the hybrid aircraft has low vibration levels without the use of passive or active anti-vibration systems, providing flight characteristics comparable to traditional-design helicopters. It is tailored to applications where operational costs, flight duration, and mission success depend directly on the maximum cruising speed. The company envisions a wide range of applications for this concept, including long-distance search-and-rescue (SAR) missions, coast guard duties, border patrol missions, passenger transport, offshore operations, and inter-city shuttle services. It also could be well-tailored for military missions in special forces operations, troop transport, combat SAR, and medical evacuation due to its combination of higher cruise speeds with vertical takeoff and landing performance. Flight testing of the X³ is being performed from the DGA Flight Test Center in Istres, France. The flight test program will continue throughout 2011 to explore the hybrid helicopter’s full flight envelope and evaluate all the possibilities offered by the aircraft's new systems and technologies.